Athenahealth chief executive Jonathan Bush administered CPR to a man in San Francisco. SAN FRANCISCO — Athenahealth chief executive Jonathan Bush, who’s spent most of the week talking about how to fix American health care, paused Wednesday to tend to a patient. Bush, who once worked as an emergency medical technician in New Orleans, came upon a man who had collapsed on the sidewalk here and used the cardiopulmonary resuscitation techniques he had learned to help revive him. Bush said he applied mouth-to-mouth breathing while another bystander applied chest compression until paramedics arrived. 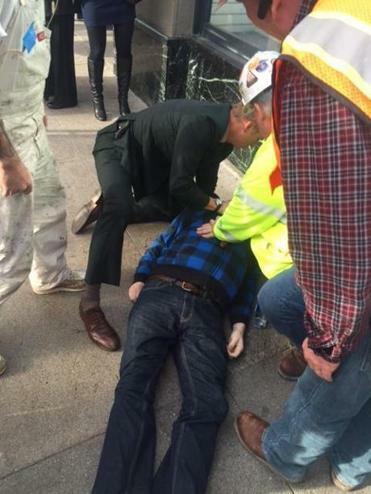 Bush said the man appeared to have fallen face down, possibly suffering from a heart attack. When he rolled the man over, his face was blue and he appeared to have stopped breathing. After the CPR, the man had resumed breathing, he said. Bush said he didn’t know who the man was, what had happened to him, or what his condition was after the paramedics took over. When he saw the man lying near the corner of Mission and 1st Street in San Francisco’s downtown, a crowd of people “were just standing around,” uncertain what to do, Bush said. Bush, whose Watertown, Mass., company is a leader in heath care data management, is in town for the annual J.P. Morgan Healthcare Conference, where he has talked about what he believes is the dysfunction in health care practice and how to use data to better coordinate care. He has spent the week dashing from one presentation and business meeting to the next. He recently hurt his knee skiing and said he was coming out of a Walgreens drugstore, where he had gone to buy an ice pack, when he spotted the man on the sidewalk.